The Harriet Tubman Underground Railroad Visitor Center is seen in Church Creek, Maryland, May 16, 2017. Beside a quiet stream on Maryland's Eastern Shore, a 19th century brick house that once served as a way station on the Underground Railroad can bring present-day visitors to tears as they gaze at the path where escaped slaves made their way to freedom. The Jacob and Hannah Leverton house is among 36 sites along the Harriet Tubman Underground Railroad Byway. The 125-mile route has been getting fresh attention in recent months as the nation and the world take more notice of Tubman's heritage as a hero of freedom. Back-lit pillars on display during a media preview of the new Harriet Tubman Underground Railroad Visitor Center in Church Creek, Maryland, March 10, 2017, help tell the story of Tubman, who was born about 10 miles away. Tubman, who escaped from slavery in antebellum Maryland to become a leading abolitionist, helped other slaves escape by guiding them north on the Underground Railroad and served as a Union spy during the Civil War. "It's hard to identify with George Washington, unless you're an older white male. But when it comes to Tubman, there's so many ways that people of all backgrounds and races ... can find something that they can see in themselves that she has carried forward or she held herself,'' says Kate Larson, an author and historian who has written about Tubman and worked as a consultant on the byway. 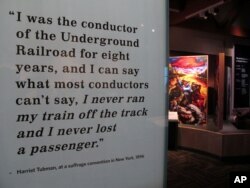 The famed Underground Railroad conductor is drawing admiration from new generations. Plans to put her on the $20 bill have received prominent attention, stirring debate about the representation of old white historic figures on the nation's currency and the lack of women and minorities. A Civil War-period carte-de-visite album with 48 photographs, including a previously unrecorded image of Harriet Tubman, is up for auction at Swann Auction, as seen in this undated handout photo. This year, the Library of Congress and the Smithsonian Institution's new National Museum of American History and Culture in Washington acquired a rare photograph of Tubman in her late 40s. In March, the $21 million Harriet Tubman Underground Railroad Visitor Center opened, not far from her Maryland birthplace. The designated sites and nearby landscapes offer a comprehensive look into Tubman's life and journeys along the Underground Railroad, an informal network that helped escaping slaves evade capture and reach free states such as nearby Pennsylvania. After about 18 years of planning, the first stops along the byway were designated in 2013 to coincide with the centennial of Tubman's death. Mayor Victoria Jackson-Stanley poses for a photograph outside the Dorchester County Courthouse in Cambridge, Maryland, a stop on the Harriet Tubman Underground Railroad Byway, May 25, 2017. Tubman was featured recently in "Underground,'' a WGN television drama about the Underground Railroad. Actress Aisha Hinds, who played Tubman, attributes the abolitionist's increasing prominence partly to the divided times of the present. "I feel like, contextually, what we're living now is sort of a modern day manifestation and articulation of the times that Harriet Tubman was living and the obstacles that she transcended,'' Hinds said at a conference on Tubman in Cambridge, Maryland. The site of Tubman's first known act of defiance against slavery is one of the most popular stops on the Tubman byway. The Bucktown Village Store has been restored at a rural crossroads believed to be where Tubman refused a slave owner's orders to help him detain another slave. When the other slave ran, the owner grabbed a 2-pound weight and threw it at him, hitting Tubman on the head and causing an injury that would trouble her for the rest of her life. Photo shows the interior of the Bucktown Village Store, a rural store building that has been restored on the spot believed to be where Harriet Tubman refused a slave owner's orders to help him detain the slave, in Bucktown, Maryland, May 12, 2017. 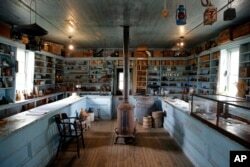 The inside still looks like a 19th century shop. The owners have some Tubman-related items, including a newspaper advertising a reward for Tubman and two of her brothers. Susan Meredith, who owns the site with her husband, says people have been stopping more frequently since the visitors' center opened nearby. "We see people from all over the world that come to see and step in the place that she was in,'' Meredith says. Some areas with significant links to Tubman's early life are neither open to the public nor designated on the byway but could one day be purchased by the state. Some related sites have inconsistent hours, depending on when property owners are home, and are still developing under the added attention. The Jacob and Hannah Leverton home, which is on the byway, offers mixed signals. A sign with the words "Private Drive'' and "No Trespassing'' stands at the foot of the drive, next to an interpretive marker that designates it as a byway stop. Michael McCrea shows where people have come to touch his house, the former home of Jacob and Hannah Leverton, once a key stopping point for slaves seeking sanctuary on the Underground Railroad in Preston, Maryland, May 12, 2017. Still, Michael McCrea, who bought the house in the mid-1980s, is enthusiastic about the byway and accommodates visitors, even though the sign remains. "It's fine,'' he says, mentioning that visitors have been undeterred by the sign to get a closer look. McCrea has shown people around the property. Some have cried, he says, while others solemn rub the bricks of the house. "They just can't believe that it's here,'' McCrea says.